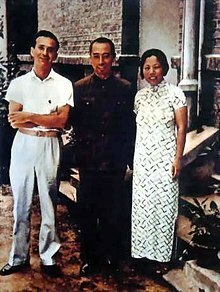 Edgar Snow (left) with Zhou Enlai and his wife Deng Yingchao, circa 1938. Edgar Parks Snow (17 July 1905 – 15 February 1972) was an American journalist known for his books and articles on Communism in China and the Chinese Communist revolution. He was the first western journalist to give a full account of the history of the Chinese Communist Party following the Long March, and he was also the first western journalist to interview many of its leaders, including Mao Zedong. He is best known for his book, Red Star Over China (1937), an account of the Chinese Communist movement from its foundation until the late 1930s. Edgar was born in Kansas City, Missouri. Before settling in Missouri, his ancestors had moved to the state from North Carolina, Kentucky, and Kansas. He briefly studied journalism at the University of Missouri, and joined the Zeta Phi chapter of the Beta Theta Pi fraternity, but moved to New York City to pursue a career in advertising before graduating. He made a little money in the stock market shortly before the Wall Street Crash of 1929. In 1928 he used the money to travel around the world, intending to write about his travels. He made it to Shanghai that summer, and stayed in China for thirteen years. He quickly found work with the China Weekly Review, edited by J.B. Powell, a graduate of the Missouri School of Journalism. He became friends with numerous prominent Chinese writers and intellectuals, including Soong Ching-ling. In his early years in China he supported Chiang Kai-shek, noting that Chiang had more Harvard graduates in his cabinet[who?] than there were in Franklin Roosevelt's. In 1932 he married Helen Foster, who was working in the American Consulate until she could begin her own career in journalism, writing under the pen-name "Nym Wales." Through much of the 1930s, while living in Shanghai, Snow traveled widely through China, often on assignment for the Chinese Railway Ministry. While working in Shanghai he toured famine districts in Northwest China. He also visited what would later become the Burma Road, and reported on the Japanese invasion of Manchuria. He became a correspondent for the Saturday Evening Post. In 1933, after a honeymoon in Japan, Snow and his wife moved to Beiping, as Beijing was called at that time. They taught journalism part-time at Yenching University, the leading university in China at that time. He and his wife studied Chinese and became modestly fluent. In addition to writing a book on Japanese aggression in China, Far Eastern Front, he also edited a collection of modern Chinese short stories (translated into English), Living China. They borrowed works on current affairs from the Yenching library and read the principal texts of Marxism. The couple became acquainted with student leaders of the anti-Japanese December 9th Movement. Through their contacts with the underground communist network, Snow was invited to visit Mao Zedong's headquarters. Edgar Snow with Mao Zedong and Liu Shaoqi in Beijing in 1960. In June 1936, Snow left Beiping with a letter of introduction from Soong Ching-ling (who was a politically important supporter of the Communists) and arrived at Xi'an. The Nationalist army was formally blockading areas controlled by the Communists, but Zhang Xueliang’s Manchurian army[clarification needed] soldiers stationed in Xi'an wanted to work with the Communists in order to oppose the Japanese, and it allowed Snow to enter. Snow was accompanied on the journey by George Hatem (a friend of Agnes Smedley), who had written about the Chinese communists, but whose presence was kept secret for many years. Snow had been preparing to write a book about the Communist movement in China for several years, and he had even signed a contract at one point. However, his most important contribution was the interviews that he had conducted with the top leaders of the party. When Snow wrote, there were no reliable reports reaching the West about what was going on in the Communist-controlled areas. Other writers, such as Agnes Smedley, had written in some detail about the Chinese Communists before the Long March, but none of these writers had ever visited them or even conducted first-hand interviews with the new leadership which had emerged during the Long March. Snow was taken through the military quarantine lines to the Communist headquarters at Bao'an, where he spent four months (until October 1936) interviewing Mao and other Communist leaders. He was greeted by crowds of cadets and troops who shouted slogans of welcome, and Snow later recalled "the effect pronounced upon me was highly emotional." Over a period spanning ten days, Mao met with Snow and narrated his autobiography. Although Snow did not know it at the time, Mao was quite cautious during these interviews, and although he claimed that he had been under no constraint, Snow made a number of revisions at the request of Mao or Zhou. After he returned to Beiping in the fall, he wrote frantically. First he published a short account in China Weekly Review, then a series of publications in Chinese. Red Star Over China, published first in London in 1937, was given credit for introducing both Chinese and foreign readers not so much to the Communist Party, which was reasonably well known, but to Mao Zedong. Mao was not, as had been reported, dead, and Snow reported that Mao was a political reformer, not the purely military or radical revolutionary that he had been during the 1920s. In the first four weeks after its publication, Red Star over China sold over 12,000 copies, and it effectively made Snow world-famous. The book quickly became a "standard" introduction to the early Communist movement in China. After the Japanese invasion of China in 1937, the Snows became founding members of the Chinese Industrial Cooperative Association (Indusco). The goal of Indusco was to establish workers' cooperatives in areas not controlled by the Japanese, through which Chinese workers would be provided with steady employment, education, consumer and industrial goods, and the opportunity to manage their own farms and factories. Snow's work in Indusco mainly involved his chairmanship of the Membership and Propaganda Committee, which managed public and financial support. Indusco was eventually successful in creating 1,850 workers' cooperatives. Snow again visited Mao in Yan'an in 1939. In Shanghai a few Japanese deeply felt the shame and the humiliation. I remember, for example, talking one evening to a Japanese friend, a liberal-minded newspaper man who survived by keeping his views to himself, and whose name I withhold for his own protection. "Yes, they are all true," he unexpectedly admitted when I asked him about some atrocity reports, "only the facts are actually worse than any story yet published." There were tears in his eyes and I took his sorrow to be genuine. His report on the Nanking Massacre appeared in his 1941 book Scorched Earth. Japan was full of decent people like them who, if they had not had their craniums stuffed full of Sun goddess myths and other imperialist filth, and been forbidden access to 'dangerous thoughts,' and been armed by American and British hypocrites, could easily live in a civilized co-operative world if any of us could provide one. In this international cataclysm brought on by fascists it is no more possible for any people to remain neutral than it is for a man surrounded by bubonic plague to remain 'neutral' toward the rat population. Whether you like it or not, your life as a force is bound either to help the rats or hinder them. Nobody can be immunized against the germs of history. By 1944, Snow was wavering on the question of whether Mao and the Chinese Communists were actually "agrarian democrats," rather than dedicated communists bent on totalitarian rule. His 1944 book, People On Our Side, emphasized their role in the fight against fascism. In a speech, he described Mao and the Communist Chinese as a progressive force who desired a democratic, free China. Writing for The Nation, Snow stated that the Chinese Communists "happen to have renounced, years ago now, any intention of establishing communism [in China] in the near future." After the war, Snow retreated from this view of the Chinese communists as a democratic movement. While working as a correspondent in Russia, he wrote three short books about Russia's role both in World War II and world affairs: People on Our Side (1944); The Pattern of Soviet Power (1945); and, Stalin Must Have Peace (1947). In 1949 Snow divorced Helen Foster and married his second wife, Lois Wheeler. They had a son, Christopher (born 1949) who died of cancer in October 2008, and a daughter, Sian (born 1950), named after the Chinese city Sian (now Xian), who lives and works as a translator and editor in the Geneva region, not far from her mother. Because of his relationships with communists and his highly favorable treatment of them as a war correspondent, Snow became an object of suspicion following World War II. During the McCarthy period, he was questioned by the FBI and asked to disclose the extent of his relationship with the Communist Party. In published articles, Snow lamented what he saw as the one-sided, conservative, and anti-communist mood of the United States. Later in the 1950s, he published two more books about China: Random Notes on Red China (1957), a collection of previously unused China material of interest to China scholars; and, Journey to the Beginning (1958), an autobiographical account of his experiences in China before 1949. During the 1950s, Snow found it difficult to make a living through his writing, and he decided to leave the United States. He moved with his wife to Switzerland in 1959, but remained an American citizen. He returned to China in 1960 and 1964, interviewed Mao Zedong and Zhou Enlai, traveled extensively, and talked with many people. His 1963 book, The Other Side of the River, details his experience, including his reasons for denying the fact that China's 1959-1961 crisis the Great Leap Forward was actually a famine. In 1970, he – this time with his wife, Lois Wheeler Snow – made a final trip to China. In December 1970, Mao Zedong called Snow to his office one morning before dawn for an informal talk lasting over five hours, during which Mao told Snow that he would welcome Richard Nixon to China either as a tourist or in his official capacity as President of the United States. Snow reached an agreement with Time magazine to publish his final interview with Mao, including the Nixon invitation, provided the earlier interview with Zhou Enlai was also published. The White House followed this visit with interest but distrusted Snow and his pro-communist reputation. When Snow came down with pancreatic cancer and returned home after a surgery, Zhou Enlai dispatched a team of Chinese doctors to Switzerland, including George Hatem. Half of Edgar Snow's ashes are buried on the campus of Peking University, Beijing, alongside Weiming Lake. Snow died on February 15, 1972, the week President Nixon was traveling to China, before he could see the normalization of relations. He died of cancer, at the age of 66, at his home in Eysins near Nyon, Vaud, Switzerland. After his death, his ashes were divided into two parts at his request. One half was buried at Sneden's Landing, near the Hudson River. The other half was buried on the grounds of Peking University, which had taken over the campus of Yenching University, where he had taught in the 1930s. His final book, The Long Revolution, was published posthumously by Lois Wheeler Snow. In 1973 Lois Wheeler Snow went to China to bury half of her husband's ashes in the garden of Peking University. In 2000 – together with her son Chris – she traveled to Beijing in support of women who lost their children in the Tian An Men massacre of 1989. One of these mothers was under house arrest and refused visits by others, while another was arrested after receiving financial assistance from Wheeler Snow. Wheeler Snow issued statements of protest to the international press and threatened to remove her husband's remains from Chinese soil. In her letter to the Chinese ambassador in Geneva, Wheeler Snow expressed her wish that the people of China be liberated from oppression, corruption and misuse of power – just as she and her husband had expressed in 1949. Snow's reporting from China in the 1930s has been both praised as prescient and blamed for the rise of Mao's communism. Some China historians have judged Snow's writing very positively. John K. Fairbank praised Snow's reporting for giving the West the first articulate account of the Chinese Communist Party and its leadership, which he called "disastrously prophetic". Writing thirty years after the first publication of Red Star Over China, Fairbank stated that the book had "stood the test of time... both as a historical record and as an indication of a trend." Fairbank agrees that Snow was used by Mao, but defended Snow against the allegation that he was blinded by Chinese hospitality and charm, insisting that "Snow did what he could as a professional journalist." Other historians have been more critical of Snow. Jung Chang and Jon Halliday's biography, Mao: The Unknown Story, describes Snow as a Mao spokesman and accuses him of supplying myths, asserting that he lost his objectivity to such an extent that he presented a romanticized view of communist China. In Mao: A Reinterpretation, a work sympathetic to Mao, Lee Feigon criticizes Snow's account for its inaccuracies, but praises Red Star for being "[the] seminal portrait of Mao" and relies on Snow's work as a critical reference throughout the book. Red Star Over China (various editions, London, New York, 1937–1944). Reprinted Read Books, 2006, ISBN 978-1-4067-9821-0; Hesperides Press, 2008, ISBN 978-1-4437-3673-2. People On Our Side. . Random House, 1944. Stalin Must Have Peace. Random House, 1947. Red China Today: The Other Side of the River. . Gollancz, London, 1963. New edition, Penguin Books, 1970. ISBN 0-14-021159-4. Journey to the Beginning: a memoir, 1958. ^ a b c d e f g h i Curators of the University of Missouri. "Edgar Parks Snow (1905-1972) Papers". University Archives: University of Missouri-Kansas City. July 08, 2010. Retrieved July 7, 2014. ^ Curators of the University of Missouri. "About Edgar Snow" Archived 2014-07-14 at the Wayback Machine. The Edgar Snow Foundation. 2013. Retrieved July 7, 2014. ^ a b c d Thomas, Season of High Adventure, 107-125. ^ Brady, Anne-Marie (2003). Making the Foreign Serve China: Managing Foreigners in the People's Republic. Lanham: Rowman & Littlefield Publishers. ISBN 0742518612. pp. 42-46. ^ Israel, Jerry. "'Mao's Mr. America': Edgar Snow's Images of China". Pacific Historical Review. 47.1. (Feb. 1978): 107-122. p.107. Retrieved July 7, 2014. ^ Hamilton, John Maxwell. Edgar Snow: A Biography. United States of America: John Maxwell Hamilton. 1988. ISBN 0-253-31909-9. p.2 Retrieved July 7, 2014. ^ a b "Edgar Snow". Spartacus Educational. September 1997. ^ Robert M. Farnsworth (1996). From Vagabond to Journalist: Edgar Snow in Asia, 1928-1941. University of Missouri Press. pp. 326–327. ^ Hamilton (2003), p. 153. ^ a b c Qin, Amy (12 April 2018). "Lois Wheeler Snow, Critic of Human Rights Abuses in China, Dies at 97". The New York Times. p. A29. Retrieved 16 April 2018. ^ Saxon, Wolfgang (14 January 1997). "Helen Foster Snow, 89, a Founder Of Industrial Co-ops in China". The New York Times. Retrieved 16 April 2018. ^ Whitman, Alden (16 February 1972). "Edgar Snow Dies; Wrote About China". The New York Times. p. A1. Retrieved 16 April 2018. ^ Tyler, Patrick (2000). A Great Wall: Six Presidents and China: An Investigative History. New York: Public Affairs. pp. 81–86. ^ Thomas, Season of High Adventure pp. 335-6. ^ John K. Fairbank (1989-04-27). "Mao and Snow". New York Review of Books. ^ Chang, Jung and Halliday, Jon, Mao: The Unknown Story, Jonathan Cape, London (2005), ISBN 0-224-07126-2, p. 106. ^ Jonathan Mirsky, "Message from Mao" (review of Hamilton. Edgar Snow: A Biography) New York Review (February 16, 1985). Dimond, E. Grey. Ed Snow Before Paoan: The Shanghai Years. Diastole Hospital Hill, Inc., University of Missouri-Kansas City, 1985. Farnsworth, Robert. Edgar Snow's Journey South of the Clouds. Columbia: University of Missouri Press, 1991. Farnsworth, Robert. From Vagabond to Journalist: Edgar Snow in Asia 1928-1941. Columbia: University of Missouri Press, 1996. French, Paul. Through the Looking Glass: Foreign Journalists in China, from the Opium Wars to Mao. Hong Kong University Press, 2009. Hamilton, John Maxwell (2003). Edgar Snow: A Biography (revised ed.). Baton Rouge: Louisiana State University Press. ISBN 0807129127. Mirsky, Jonathan. "Message from Mao", New York Review (February 16, 1985): 15-17. Review. Snow, Edgar. Journey to the Beginning. New York: Random House, 1958. Memoir. Thomas, S. Bernard. Season of High Adventure: Edgar Snow in China, Berkeley: University of California Press, 1996. Entell, Peter (2012). "A Home Far Away". Show and Tell Films. Retrieved 16 November 2013. This page was last edited on 26 February 2019, at 01:00 (UTC).